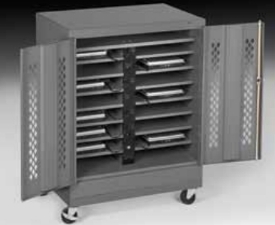 Secure Laptop Cabinets store and charge laptops, PDAs, cell phones and tablets securely. 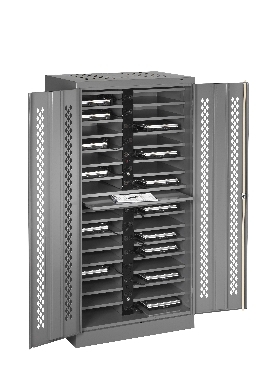 With power available to charge multimedia devices and a roll-out workshelf, these fully welded cabinets offer a solution for secure storage. Our Laptop Charging Station is the ideal solution for charging multiple laptops in one convenient cabinet. 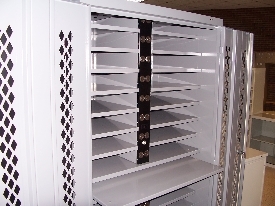 Both sized cabinets feature perforated doors which allow heat to dissipate, providing a safe environment. Choose from either our 72" high unit which features 32 outlets or our 42" high unit which features 16 outlets. Both electrical power strips feature a power switch and a 15 amp circuit breaker with a reset button. Create an instant workspace with our pull-out reference shelf; only available on our 72" high cabinet. Adding mobility allows the cabinet to be where you need to be; available on both our 42" and 72" high cabinets.